Eastern MO Beekeepers Association (EMBA). The EMBA has been an amazing community and resource. They have been excellent mentors and helped up establish our bee sanctuary. In addition, we worked with two Washington University students Anya Liao (printmaker) and Ryan A. Wilson (architect) that helped us construct and design our urban garden. We created eight garden beds (six veggie and two flower). 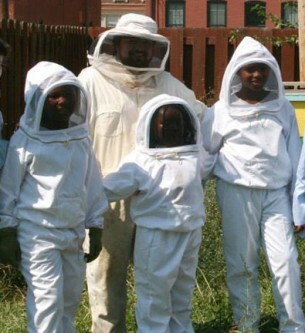 Bee sanctuary and an urban garden will be the outdoor classroom for five summer workshop this summer.